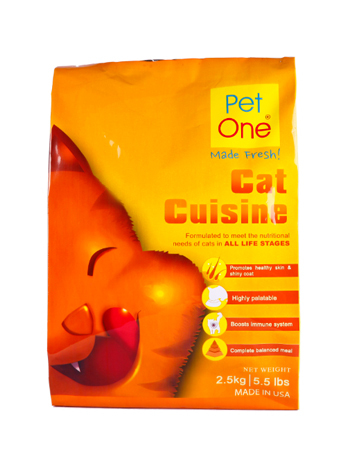 Pet One Cat Cuisine is distinctly designed for cats in all life stages. Its formulation includes a special mix of highly digestible ingredients and easily absorbed vitamins and minerals that are sure to be a healthy and palatable staple for your playful cats. 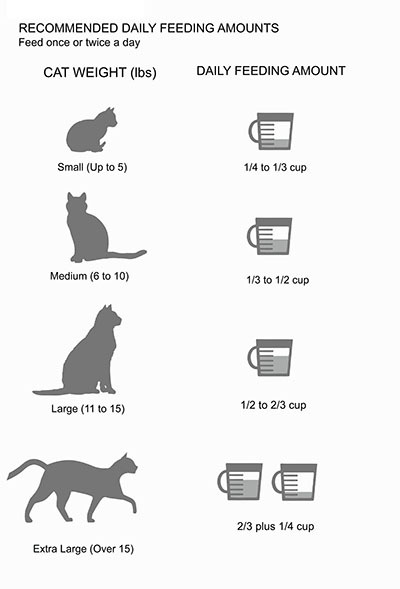 Ensure your cat’s optimum health and overall wellness with Cat Cuisine. Ground Corn, Poultry Meal, Wheat Flour, Poultry Fat (Naturally preserved with mixed Tocopherols), Dried Beet Pulp, Brewers Dried Yeast, Natural Flavor, Potassium Chloride, Salt, Calcium Carbonate, Phosphoric Acid, L-Lysine, DL Methionine, Taurine. VITAMIN and MINERAL Premix: Kelp Meal, Vitamin E Supplement, Niacin Supplement, Vegetable Oil, Biotin, Thiamine Mononitrate, Pyridoxine Hydrochloride, Vitamin A Acetate, Riboflavin Supplement, d-Calcium Pantothenate, Vitamin B12 Supplement, Citric Acid, Vitamin D3 Supplement, Folic Acid, Potassium Chloride, Ferrous Sulfate, Zinc Sulfate, Zinc Proteinate, Iron Proteinate, Zinc Oxide, Copper Sulfate, Manganese Sulfate, Manganese Proteinate, Copper Proteinate, Manganous Oxide, Sodium Selenite, Calcium Iodate.